Mayors from cities across the U.S. are stepping up and committing to broad and inspirational action to reduce greenhouse gas emissions and decarbonize local energy systems. This leadership is especially critical given lack of federal climate action, but translating a mayoral commitment to reality can be a challenge. City staff face many hurdles when attempting to transition to renewable energy quickly. Chief among them is the challenge of working within complex market and regulatory frameworks that vary from state to state and can limit the options for purchasing renewable energy. Once cities identify which renewable options are available to them, they must then consider city and community specific prioritiesfor example, how renewables align with workforce development and resilience initiatives. 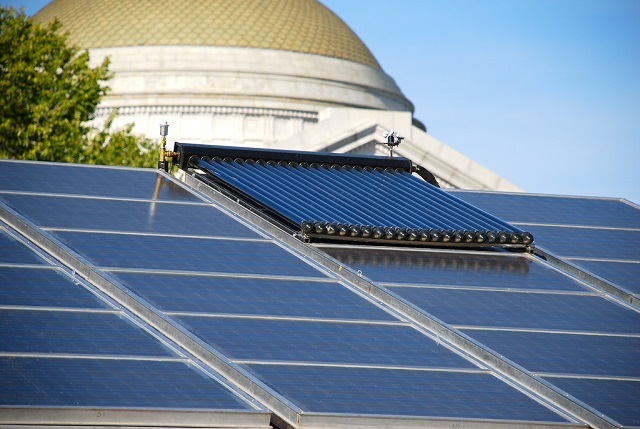 Finally, cities must navigate political and financial challenges, such as financing the upfront cost of installing on-site solar, negotiating contract duration and ensuring that renewable energy access and benefits are spread equitably across the community. In 2017, the City of Philadelphia released a municipal energy master plan laying out a roadmap to drastically reduce the city’s carbon emissions and transition municipal energy use to 100 percent renewables by 2030. To achieve such an ambitious goal, the city needed to locate new sources of renewable energy to meet increasing demand. City staff began exploring the potential for a power purchase agreement (PPA), a contract that allows a city to buy electricity directly from a solar developer rather than from a utility. Philadelphia’s city council hadn’t passed the legislation necessary to enable this type of contract. 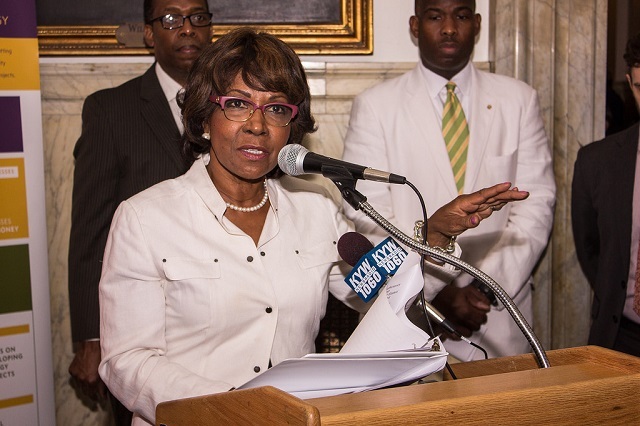 In response, Councilwoman Blondell Reynolds Brown worked with the Philadelphia Energy Authority and Community Energy, a solar developer, to create a bill that would allow the city to enter a PPA. Once the bill passed, the city signed an agreement with the Philadelphia Energy Authority to construct a 70 megawatt solar facility—the largest in Pennsylvania, which will meet 22 percent of Philadelphia’s municipal energy load. This victory can serve as an example to other cities who are unable to procure renewable energy through their utilities and whose state law is a barrier to other solutions. Other cities may examine the legislation as a template and engage similar stakeholders as they craft specific language and solutions. Cities have more buying power when they band together. Often, cities will partner to negotiate a contract like a PPA. The City of Boston is bringing this approach to renewable energy purchasing to show project developers just how much demand there is for clean energy. Cities from around the U.S., including Chicago, IL; Houston, TX; and Portland, OR have joined in the multi-city, multi-state request for information (RFI), which is the first of its kind in the U.S. By using a broad RFI, the city was able to get feedback from multiple developers before entering into a contract, providing an opportunity to negotiate more favorable terms for the city. For many cities, working in partnership with their utility to access renewable energy solutions is essential. In states that have limited options due to the regulatory structure of their electricity markets, this collaboration may even include creating or expanding green tariff programs, which allow a city to purchase large-scale renewable energy through its utility. In 2016, Salt Lake City signed a Clean Energy Cooperation Statement with Rocky Mountain Power (RMP) with the goal of having a 100 percent community renewable electricity supply by 2032. Two years later, it followed up with a Clean Energy Implementation plan. This collaboration was key in finding solutions that could deliver large-scale energy in addition to onsite solar at its municipal operations. Salt Lake City has made use of RMP’s Subscriber Solar Program, which allows them to subscribe to portions of a large scale solar project to increase their renewable consumption easily. As their collaboration with RMP continues, the city anticipates new options for large-scale procurement through green tariffs and community-wide solutions. While many cities have committed to powering their municipality with 100 percent renewables, only a handful are expanding that commitment to the entire community. On the same day President Trump withdrew the U.S. from the Paris Agreement, the City of Portland and Multnomah County, Oregon passed a resolution establishing a community-wide 100 percent renewable energy goal. Central to this effort is developing a community solar program that enables broad access to renewables for low-income communities. Building on past initiatives such as the Solar Forward and Solarize Portland programs, this new program will allow individuals who don’t own their homes or don’t have money or space to install solar panels to still reap the benefits of clean energy. The Portland Clean Energy Fund, passed in November 2018, provides a dedicated revenue stream to bring renewable energy to the community – and at least 50 percent will go toward low-income residents and communities of color. U.S. cities will be vital in transitioning the nation to a low-carbon power system as we face little action on clean energy at the federal level. These success stories represent just the beginning of city leadership on clean energy solutions, and more cities will need to follow in the footsteps of Philadelphia, Boston, Salt Lake City and Portland for the U.S. to prevent the effects of climate change—and win the benefits of a clean energy future. The Renewables Accelerator is a key resource for cities already leading on procuring renewable energy and those kickstarting their clean energy programs. The Accelerator brings cities together to share successes and challenges, learn from each other and access technical support. Learn more about the American Cities Climate Challenge Renewables Accelerator at www.cityrenewables.org. Heidi Bishop Ratz is the Manager for U.S. Electricity Markets working across the Energy and Climate programs at WRI.